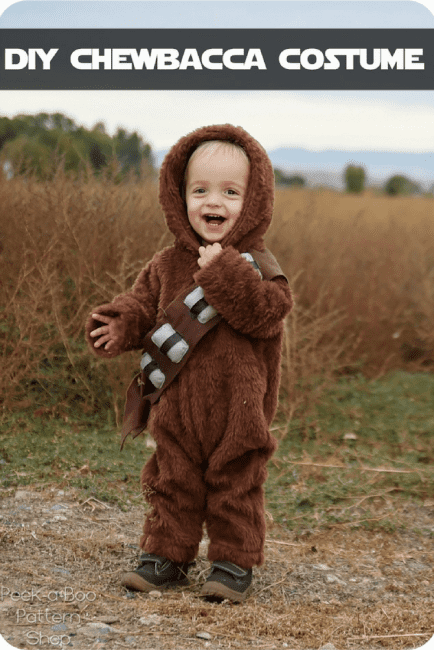 DIY Chewbacca Costume - Peek-a-Boo Pages - Patterns, Fabric & More! You’ll have to come back tomorrow to learn how to make Han Solo. My boys had so much fun with these costumes! Today is all about our little wookie though so let’s get started! 1. Sew your body. 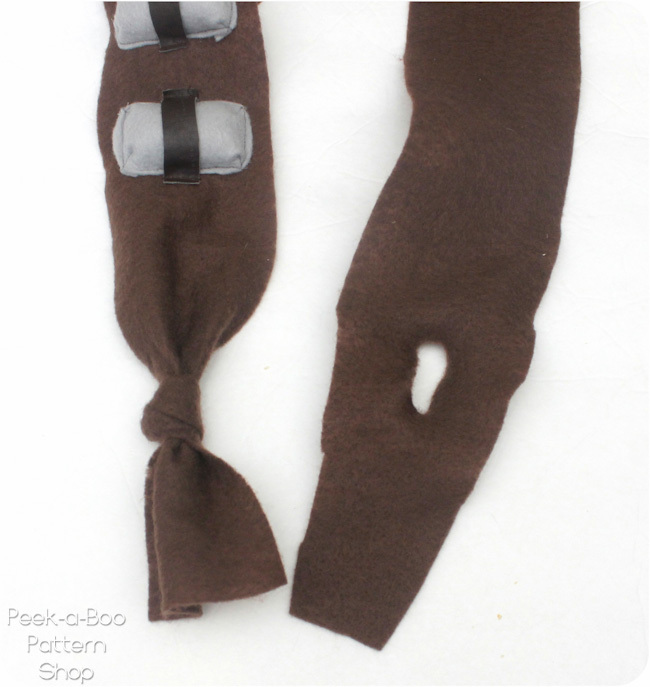 I added 1″ to the sleeve inseam and pajama side seams to allow enough room to layer over other clothing and account for the bulky fur. This is a size 18 months. In larger sizes you may want a bit more extra ease added. I skipped the feet and sleeve cuffs and did a simple hem. I made the hood one size larger than usual since the fur is pretty bulky and my baby has a big noggin. I widened the pajama neckline to match the size of the hood and then just sewed it on with right sides together. This was actually a very easy and quick costume to make and took me about 2 hours including cutting for the body. You could use this as the base for tons of costumes! Faux fur is scratchy on the inside but we just layer over a thin pair of pjs and he didn’t mind one bit. 2. Now we’ll make his ammo sash (no clue what this is called?). 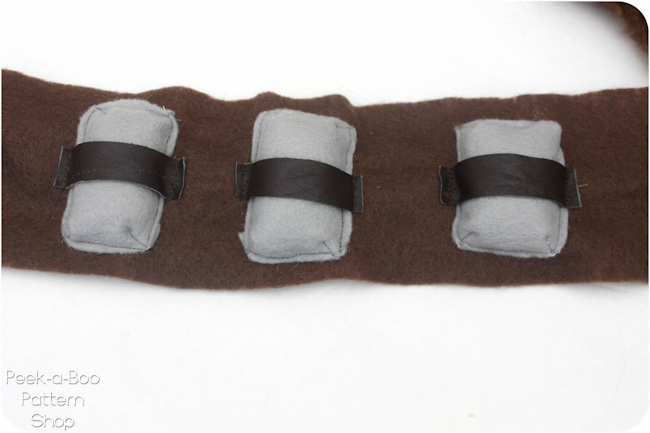 Cut a piece of brown felt long enough to wrap around one shoulder and your desired width (mine is 46×4″). 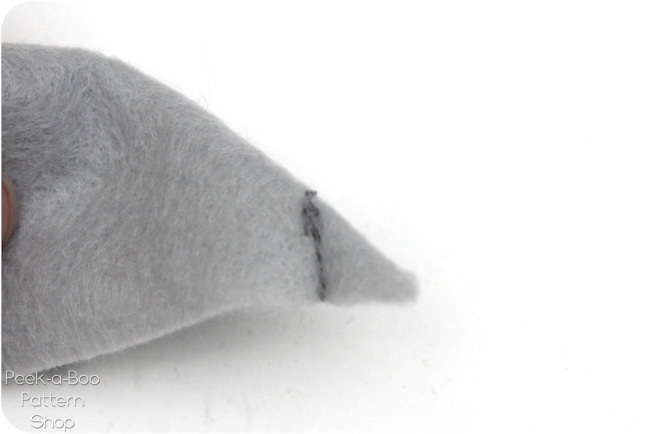 The ammo is made from gray rectangles of felt (mine are 2 x 3″ and I made 4). To make the ammo 3D I boxed out each corner. Pinch the rectangle at each corner and then sew across the tip about 1/4-1/2″ in from the point. 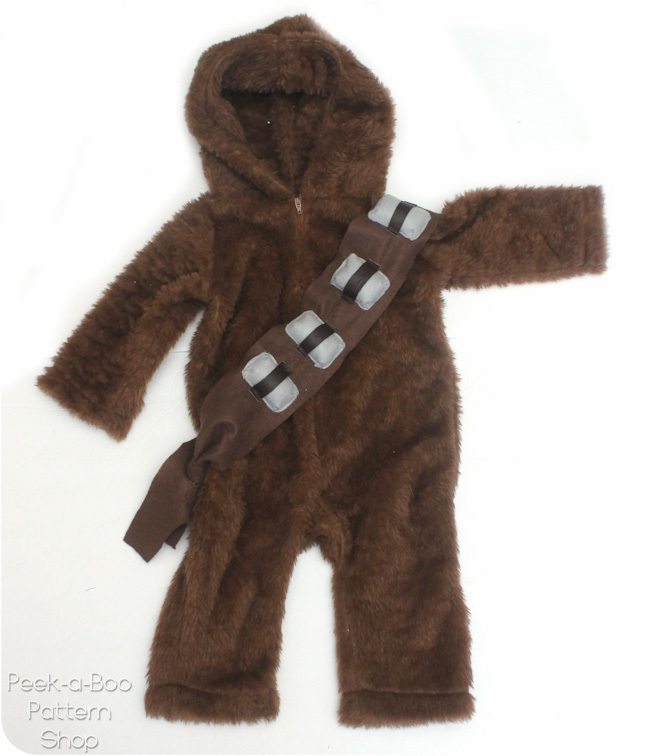 How many yards of faux fur did you get for the 18-24 month chewy costume? I’m thinking maybe 1.5 yards? Would you consider selling the chewbacca costume?